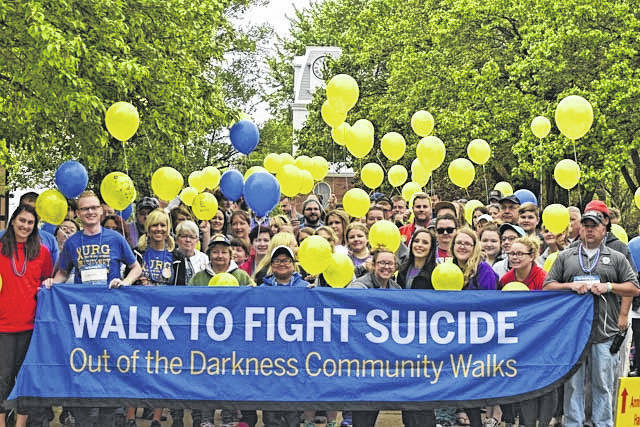 RIO GRANDE — The University of Rio Grande will host its’ second annual Out of the Darkness Campus Walk on Saturday April 14. Teams are already forming and have begun fundraising to help raise awareness about the issue of suicide. “Our tiny community is no stranger to the pain. Since beginning to advocate for heightened awareness in Gallia County, I have been approached by many families who have been impacted by the heartache and devastation as a result of loved ones who died by suicide,” said Kelly Bonice, director of Accessibility and Mental Health Services and Survivor Advocate. The walk consists of teams that raise awareness of the walk and its main subject. The fundraising aspect is there to help fund research for suicide prevention, advocacy for public education and policy regarding suicide, and support survivors of suicide loss. This year they have set the goal of $5,000 to raise, same as last year’s goal which they exceeded with over 100 walkers. Suicide has become an issue in the area, causing more groups to take action to promote awareness and respond to the matter. According to Bonice, the purpose of the walk is to engage individuals in the American Foundation for Suicide Prevention’s programs and raise funds for suicide prevention and programs. Registration for the event is free, although there is incentive for teams to raise funds. Registration can be done online at afsp.org/Rio. “We need to end the stigma that surrounds talking about mental health and suicide. Our youth and young adults need to know that suicide is not the only option. They need to know that it’s okay to ask for help, that it doesn’t make them look weak,” said Whitt. Whitt is a part of team Chief, the nickname of her nephew Anthony.